This book explores the theory and techniques involved in proving algebraic inequalities. To expand the reader's mathematical toolkit, the authors present problems from journals and contests from around the world. Inequalities are an essential topic in Olympiad problem solving, and 109 Inequalities will serve as an instructive resource for students striving for success at national and international competitions. Inequalities are also of great theoretical interest and pave the way towards advanced topics such as analysis, probability theory, and measure theory. Most of all, the authors hope that the reader finds inspiration in both the struggle and beauty of proving algebraic inequalities. A publication of XYZ Press. Distributed in North America by the American Mathematical Society. Middle and high school students interested in mathematics competition preparation. 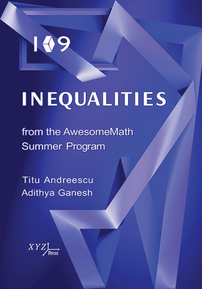 "109 Inequalities from the AwesomeMath Summer Program" lives up to its promise as an instructive resource for students striving for success at national and international competitions...[T]he problems form an excellent training regimen for mathematical inequalities and will help readers master the subject...It is an excellent resource and would be a valuable addition to a problem solver's library.